This is the era of many interesting events in the Earth’s history. There were changes and developments everywhere in the Earth. Unlike the other ancient eras the Proterozoic Era contains good evidence of fossils, mainly of archaeans and bacteria. These evidences are the proofs that living organisms were in abundance in this era which lasted from 2.5 billion years to 543 million years ago. Along with these two major living organisms existence of eukaryotic cells are also known by the fossils of the same. At the mid of the Proterozoic Era there was an increase in the atmospheric oxygen. Though this improved level of oxygen in the air cause catastrophe for the bacteria but it helped the eukaryotic cells to grow profusely. Multicellular algae are included in this group and finally the first animals appeared at the end period of the Proterozoic Era. This era is divided into 4 major periods and each of these periods has special features which contribute to understand the Proterozoic Era. 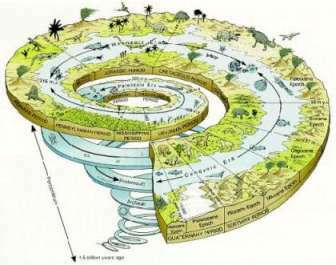 The four divisions of the Proterozoic Era are the Siderian Period, the Rhyacian Period, the Orosirian Period, and the Statherian Period. As stated above, there was in an increase in the level of oxygen in the atmosphere. It is surprising to know that the Earth was hit by pollution crisis for the first time in this era. Evidences of increased level of atmospheric oxygen in this era are enough like the red beds which contain metal oxides, fossil soils which contained iron oxides. According to the researchers, the levels of oxygen was less than the present level by 1% at the time archaean but this level increased by 15% at least 1.8 billion years ago and still now the level is rising. It is really strange and contradictory to define this rising of oxygen as a pollution crisis. It is strange because it is the cause of degradation of different organic compounds and contradictory because oxygen is the major requirement of our lives and at the same time, it is the cause of destruction of some other life forms. Even today, oxygen is used to kill several protists and bacteria. It is also interesting to know that to render oxygen harmless for them organisms had to undergone several biochemical methods like oxidative respiration. This method has the benefit to produce a large amount of energy for cells like eukaryotes. Proterozoic Era is the time of the stramolites. These bacteria continued to grow profusely throughout the Proterozoic Era and contributed richly to understand the Proterozoic life. These bacteria have been transformed into a kind of rock called stromatolitic chert where the exclusive microfossils of their microbes have been preserved. They started declining before 700 million years after reigning in the Proterozoic Era. A common theory states their mass destruction due to the herbivorous eukaryotes, which evolved during this time and mainly fed on these growing stramolites. Though they are now counted in rare fossils but they can be found in some restricted habitats of saline and shallow water, like the Shark Bay of Australia. The fossils of Proterozoic Era also include a type of macroscopic organism which was believed to exist before 2.1billion years. Also, from other types of fossils, carbon films, it can be said that life at the end of the Proterozoic Era was mainly in the form of multicellular organisms. These organisms were like circles, leaves, or ribbon and dark compressions, and small and grew profusely in the Neoproterozoic. Some of these organisms also resemble seaweeds representing eukaryotic algae. It has been proved by evidences that green algae and reec algae appeared before 1 billion years ago approximately, which is the time of the Proterozoic era. The possible localities of the Proterozoic era include White Sea, Nopah Range, Mistaken Point in Newfoundland, Ediacara Hills, and Bitter Springs Formation. Each of these places have major contributions in understanding the life and other features of the Proterozoic era. Fossils of eukaryotic cells are known to discover from this place of the late Proterozoic dolomite, which is in the central Australia. Ediacara Hills – This site is known as the fossil bed of some the oldest known animals. These fossils were discovered in 1946, in this locality of Australia. Mistaken Point, Newfoundland – Some of the mysterious fossils of the Proterozoic era were discovered from this coast of Newfoundland. This region of the Southern California is known for the oldest sedimentary rocks, which date back to 1.5 billion years ago. The rocks are rich with the deposits of stromatolites. This site is an active research center to find some of the Vendian fauna. This is also the era of significant geological changes. It is in this era that continents began to widen when the stable continents shelved and moved through the processes of plate tectonic. Erosion and deposition rapidly proceeded over those continents which were then devoid of plants. Thick beds of sandstone of pure quartz began to form rapidly. Also, formation of the banded iron beds which started in the Archean era continued throughout the Proterozoic Era. An interesting fact about these formations is that they were consisted of alternating layers of iron and quartz and are considered as the prime sources of iron in the world. These types of banded formations did not take place after the Proterozoic Era.